Mett Meet my friend Gina! Random thought from and Incoherent mind. Don't you just love the blog name? I've been married almost 19 years to my high school sweetheart, John. I have 2 kids...Olivia, age 13. Johnny age 9. I am currently working as a teacher's assistant, but was a stay at home mom for 8 years & worked in the medical field before that. I think my biggest problem is that I still haven't decided what I want to be when I grow up! Well no wonder I like Gina, I too have not figured that out! Gina has been a very long time follower/friend of my blog. She is one of the nicest gals I know. Always courteous with her visits and comments, and her time. Her blog is just darling, and everything she posts is so worthy of stopping by. and this was one was so darling..I love the snap, crackle, pop! Gina is a really good baker too, and these cookies looked delish! So there you go. A wife, a mother, an educator, and she too can be your new friend! Pop on over and give her a shout! Today was a good day of thrifting for me. You know why, because I did not even plan it. Went to lunch with friend and then I decided to go to our local thrift store that supports the humane society. Love that place! So I spied this little wood stool, and it was the perfect size. You see we have been fighting over the computer lately in our home. Not exactly fighting, because poor Mike has not much say, I just kinda take it over. Finally we broke down and bought a new home computer and Mike can have the laptop. SO I thought I would make a little space just for Mike to putz on the computer when he wants to download his music. I wanted a simple stool, low enough, and now I have to find a little table for him. Mike truly is No. 1 so I had to let him know it! I painted it with some left over Duck eggs blue CHALK paint. I lightly distressed it to have the original color show through. Now all I need to do is find Mike a cool little table for the laptop and he is good to go! Simple guy for sure! Simple pleasures, and I challenged myself to be a copy cat! Today, I am going to make my coffee talk series, short and sweet! Can you believe, I have these pretty corner windows in my kitchen, and never once do I lift the blinds and have ever put pretty little window vases with flowers in them? Now that is a simple pleasure, I have been missing out on. I bought these cute little vases from Dollar tree last year. If you have never had Aldi's chocolate I really do recommend it. (Thanks Mom) Now so far I have tried around 5 different candy bars...NOT in one day of course, but they are all good. The milk chocolate one with almonds in it, is addicting, and you can't stop at one piece..don't say I did not warn you! (these are the windows I am speaking of...Man does it look nice with the blinds up! No rocket science to figure that out, but apparently, I never thought of it! Aldi's chocolate is the very best chocolate I ever ate in my life...that is a pretty good claim, and again, I am not getting paid to say these things. 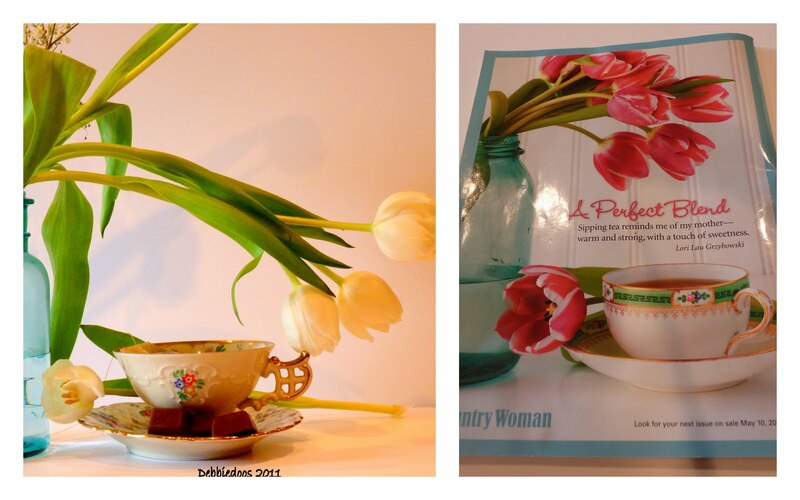 Now you want to know my challenge...OK well on the back of Country Woman magazine was a fabulous photos of flowers and tea...the gals and I admired it so. Today, I thought, I am going to try to copy that...I have so many fresh flowers around my house today, why not? Not too bad for my first time trying to copy...I do have some tweaking and learning to do. In fact I learned a few new tricks yesterday I can't wait to try sometime. Lucy on the other hand, well, let's just say, she is waiting for her day in the spotlight. You see I am exhausted. My Mommy kept me in the room all day, because of the fact, I am so cute, and love to be around people, I tend to get in the way. Someone could step on me, or something could have fallen on me. Well anyway that is OK, because guess where I am sleeping tonight? That nice fluffy white bed is calling my name. Yeah, so, don't feel too sorry for me. I do have to share though with my parents, but I will make sure they get a good night sleep. They are exhausted. I love to sleep on Dad's head, he probably won't even notice! 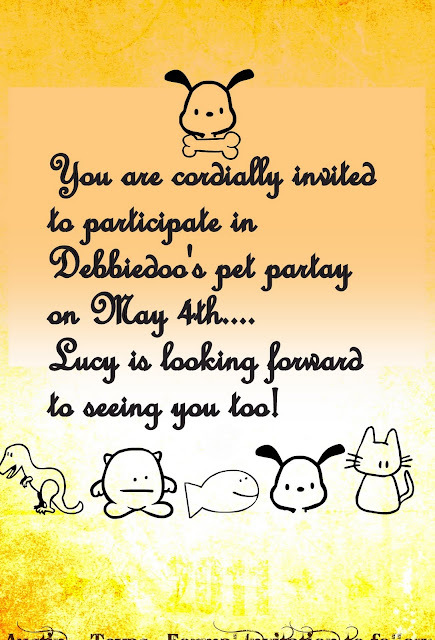 You peeps best be getting ready to join my partay too! After a while it becomes a task to think of titles for posts. I tend to title whatever the first thing that pops in my head! This by far Mike said is his favorite thing ever that his Father recently passed down to him. My husband is a really simple guy, simple pleasures, and loves things that are conversation pieces...could be a buck, but if it is cool, he loves that! So check out this little guy, he is a nut cracker, hence, the title of my post. I know, makes no sense, but humor me please, I need to grab your attention some how. This is OLD! I believe my FIL said it was for sure over 100 years old. Heavy little guy too! There is where the nut goes! I may have to try it out sometime. I found a good home for him and Mike can enjoy looking at it every day. Have you ever seen one of these nutcrackers? We really have no history on this cutie.. While I am at it, how about seeing my FREE coffee table tray. I say free, because I had a coupon to PIER I for $20.00. This tray was only $9.99, originally 39.99. I really like it, it has that rustic look, and all my favorite colors. So far so good on my moss ball, I am keeping it alive. Thanks for stopping by and your sweet, kind comments. I always tell Mike all the nice things you say, he really does care, even if he rolls his eyes at me behind my back! He so knows better to do in front of my face! ahhhh Men, they just don't get it! My romantic master bedroom reveal! Did I keep you all waiting just a little too long? Well it certainly better be worth it right? I think it was. We had to find just the right piece for over the bed. What I came to realize is Mike and I really do not have traditional art in our home. I have probably three pieces total that I have purchased from a home decor store. Most everything else is from antique store or ebay. So once I did all the other things, ie, painting furniture, curtains, some accessories. There was the dilemma. I thank Tracy and Liz for sending me links and ideas. I also thank all you other gals whom left comments and ideas on that dilemma post. It was Tracy's email, that triggered my thoughts. I wanted something white, old and chippy. This door/window with beveled glass is from the 1800's. Old, white, and chippy! This is very old hardware my husband found at a restoration place here locally in Charlotte. He also bought old hinged to add so he could hang it this way to the wall with dry anchors. Found this wonderful wire chicken wire basket at TJ Maxx. What would be a romantic bedroom without perfume and pearls. Found this old antique sconce a couple of weeks ago, I just loved the curves and the old mirror in the center. Curtains from World Market. 96 inch, for 39.99. I do have to add a tad of trim to the bottom as they do not quite touch the floor. I will do that soon. How romantic! The Bedding came from Target. It is so soft and fluffy. The center pillow came from Marshalls. It was in the Living room, but I thought it was perfect in here. And you know this time I am just not over doing it with pillows. The Bed is a Wesley Allen line. It was the only major splurge. I cut cost by painting our existing furniture to make it look old, and shabby. Now lets get this NEWBIE party started! If you are NOT a friend of mine I would love if you were. otherwise, I just delete. Sorry...but I do visit each link and appreciate others knowing about the party. There are a lot of new bloggers that would love to join in, and even existing blogs that would love to meet you as a new friend! I may not be able to comment on all my participants this week. I have a little something, something major going on this week...ALL GOOD, that much I can say:) I do thank you for joining my party though! Copper and silver, can you mix the two? I love the mix of copper and silver together in any element. Some people think you can't do it, or it does not look right. It truly depends, however I find I do it often and like it. I also love mixing gold and silver jewelery together. No matching is best for me. 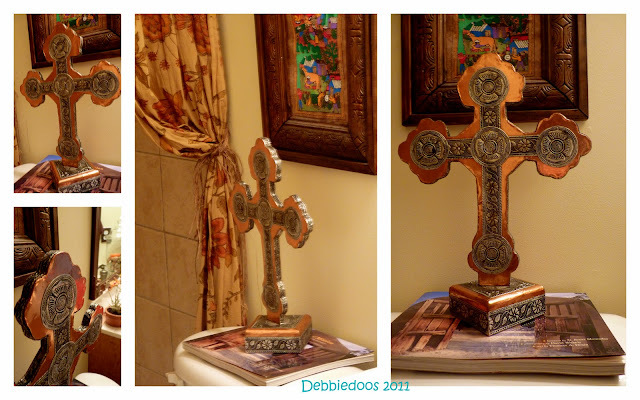 While browsing home goods with my gal pal, I spotted this gorgeous cross in the clearance section. and the only one like it. Mr. Doo's really liked this new cross too! What do you think? You like mixing the two elements, or not so much? I have since changed some things in this bathroom and will share with you a project soon. See you tomorrow night for the newbie party..
Before I get into anything too serious here, I do want to wish you all a very Blessed Easter. I really need to get off my keester now, so enjoy the smiles and will catch up soon! She really did love the Easter bunny!